On Saturday, April 1, over 130 Urban Initiatives students, parents, staff, and volunteers celebrated the 2nd Annual Embrace Chicago Cup presented by Citadel. This event engages Chicagoans in building bridges across communities, giving back to Chicago neighborhoods, and promoting learning about what our amazing city has to offer through a field trip to a major cultural institution, interactive learning stations, and a friendly soccer tournament. 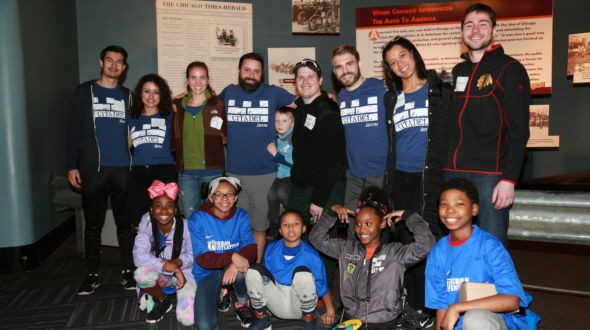 This year, students and parents from UI partner schools Beethoven, Kozminski, Reavis, and St. Angela’s spent the morning exploring the Museum of Science and Industry with a group of volunteers from Citadel and the UI Student Board. Students learned about various phenomena and inventions, including natural phenomena at the Science Storms exhibit, climate change at the Extreme Ice exhibit, and ship design, and evolution at the Ships Gallery exhibit. Following this experience and a quick lunch, participants departed the museum and were greeted by a perfect Chicago spring day at Midway Plaisance, where they played in soccer scrimmages, their parents and volunteers cheering from the sidelines. At the event, Urban Initiatives was honored to recognize Solomon Barnett of Citadel with the 2017 Chicago Impact Award for his efforts to engage his fellow Chicagoans in Urban Initiatives’ work and passion for empowering underserved youth across the city. Sol has been a key supporter of Urban Initiatives throughout the past four years. In addition to his significant personal contributions to our programming, Sol has also inspired other individuals at Citadel and throughout the larger Chicago trading community to volunteer at our events and engage with UI’s students and families. He serves on the UI Builders Board, and we are so fortunate to count him as a member of our team. Thank you to the high school students on the UI Student Board from Loyola Academy, Jones College Prep, Highland Park High School, and Fenwick High School who volunteered their Saturday to give back to the Chicago community, and to the Museum of Science and Industry for their generosity in making this day possible. Finally, Urban Initiatives would like to thank Citadel for their support of this event and our 13,000 participants across the city. We are incredibly appreciative of Citadel’s commitment to service and support of Urban Initiatives over the years.